Test equipment acquired from Omicron has greatly enhanced testing offerings at the Dolan Technology Center. Omicron Partial Discharge Measurement System is centered around the Omicron MPD-600 instrumentation. This system utilizes fiber-optics to safely couple to the object under test, which is often energized to voltages in the thousands (and higher). The accompanying software offers built-in routines so that testing can easily occur in accordance with IEC 60270, which thereby allows for comparison of datasets with others using similar instrumentation. Partial discharges can include internal discharges within voids or cavities of insulating materials, surface discharges along the insulating materials and corona discharges occurring within the gaseous dielectrics surrounding insulating materials. Target testing areas for this instrumentation include transformers, rotating machinery insulation systems and gas-insulated switchgear. Omicron Dissipation Factor/Power Factor/Tan Delta Measurement System is centered around the Omicron CPC-100 and CP-TD1 instrumentation. This system can be utilized for testing current transformers, voltage transformers, power transformers, rotating machinery insulation systems and gas-insulated systems. 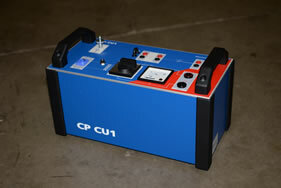 It has a built-in power source that can supply up to 12kV to an object under test. 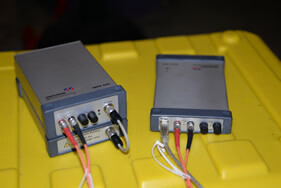 Testing can be performed over a range of frequencies, ranging from 15 Hz to 400 Hz. 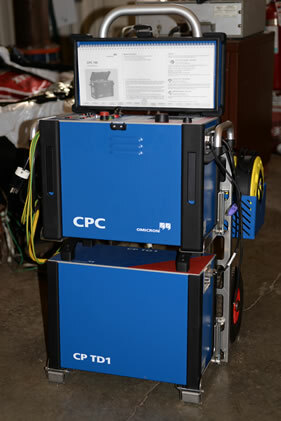 AEP Transmission recently purchased an add-on unit, the CP-CU1, that extends the testing capabilities to include transmission line impedance and station grounding assessments.